As more and more people recognize the effect appearance has on self-confidence and overall wellbeing, the more they’re turning to cosmetic dental care for stunning smiles. An attractive smile acts as a key component of looking your best, and we want you to have the most attractive smile possible. That’s why we offer a number of cosmetic dentistry procedures, allowing us to provide you with everything from a small touchup to a complete smile makeover. What Cosmetic Dentistry Services are Offered? 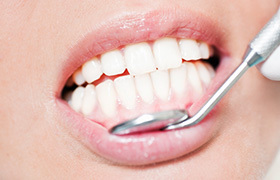 If your smile is looking a bit dull or discolored, it can be due to a number of factors. Popular drinks like coffee and wine are notorious for staining teeth, but did you know that aging and genetics can play a factor, too? If you’re looking to whiten your smile, don’t trust some generic treatment you buy at the store. Most of the time, these kits are either too weak to deliver noticeable results or so strong they can actually damage your teeth. 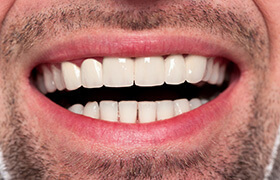 In order to the dramatically whiter smile you want, it’s always best to trust your dentist. We offer take-home whitening kits for patients that incorporate custom-crafted application trays and professional-grade whitening gel. Used consistently for about two weeks, patients see results up to ten shades brighter. We also have a whitening for life program that enables patients to touch up their smiles with regular whitening treatments free of cost. 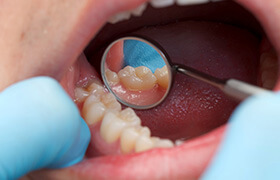 Inlays and onlays are two kinds of restorations that can be used to repair damaged teeth. They are kind of a middle ground between a dental filling and a dental crown. They enable your dentist to preserve more of your tooth’s natural structure, which in turn makes it much stronger over the long term. Porcelain veneers are one of the most popular cosmetic treatments available today, and they’re also one of the most comprehensive. With just one procedure, they can fix chipped, cracked, gapped, and even slightly crooked teeth. They are wafer-thin ceramic coverings that are attached to the front of the teeth, and they can improve a smile’s appear in every way imaginable. Each set of veneers is entirely custom-made, so they can give a patient everything from a minor touch-up to a complete makeover. They only take two appointments to get, and it’ll all start with consultation with one of our dentists. You’ll get a chance to discuss what you want your final result to look like, and once that is decided, your doctor will gently shape your teeth to hold the veneers, take an impression and sent it to a local dental lab. 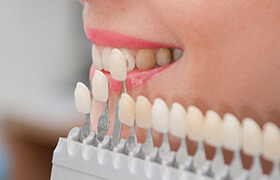 After your veneers have been created, you’ll return to our practice where they’ll be securely bonded to your teeth. After a few minor adjustments, your new smile will be ready for the world. Cosmetic bonding is done for minor chips, cracks, breaks, gaps, and stains, patients may select cosmetic bonding to correct their smiles. Using composite resin, the bonding material is applied directly to the tooth with little to no preparation. In most cases, this procedure is reversible allowing patients to undo the treatment if they aren’t 100% happy with the results. For those patients with significant decay or dental damage, who undergo root canal treatment, and who choose single tooth implant replacement, a porcelain crown is the perfect finishing touch to offer natural looking restoration. Porcelain crowns are both natural and durable making them an ideal restorative solution. Cosmetic gum sculpting involves the use of dental lasers to transform your “gummy” smile into a nice, balanced grin. Dental lasers lessen pain, shorten healing times, and provide precision gum contouring to fix gum-related cosmetic problems. The dental laser will precisely eliminate any excess gum tissue and expose more of your natural teeth. It’ll focus only on the area that needs to be treated, leaving all of the surrounding tissue alone. This will minimize any discomfort you might feel during the procedure, and it’ll also help cut down on your recovery time. Typically, this treatment can be completed in just one visit. For years, dentists used traditional amalgam fillings to repair small cavities and slightly damaged teeth, but they always left a large gray mark wherever they were used, making them instantly stand out in a person’s smile. This is why out practice prefers to use tooth-colored fillings. They are made of a strong, malleable composite resin that can be specially shaded to completely blend in with a person’s smile, meaning they don’t have to sacrifice their appearance to get the dental care they need. Even better, these fillings actually bond directly to the enamel. Amalgam fillings actually need a pocket to sit in, which meant your dentist had to remove healthy tooth structure to create it. This makes the tooth weaker and more likely to break over time. 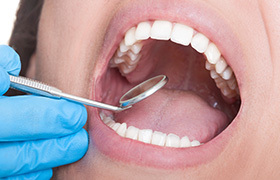 With tooth-colored fillings, however, our dentists only have to remove the damaged portion of your tooth, leaving it more intact and stronger for the long term. A complete smile makeover might include any or even all of these cosmetic dentistry procedures. Want to transform your smile with a conservative procedure that quickly provides a little boost? We might recommend teeth whitening. Want to cover a number of problems including chipping, cracking, staining, or gapping? Porcelain veneers cover up problems like these with one procedure. And all of our cosmetic dental care procedures involve discussing your specific preferences and goals in-depth beforehand to make sure your unique smile receives the care it deserves. Located in Aurora, Colorado, D'Amico and Mauck, DDS welcomes patients from the greater Denver area including Centennial, Englewood, and Parker. Make an appointment today to experience comprehensive dental care in a comfortable environment where you come first.